Final two minutes (R21) Relive the final moments between the Hawks and Cats at the MCG. Growing up a die-hard Geelong fan, James Worpel blew past one of his idols Joel Selwood to win a crucial one-on-one in the third term. The clean pick-up from a loose ball at half-forward set up a Jack Gunston goal before teammates flocked from all parts of the ground to show their appreciation. The first-year midfielder was the best player on the ground in the second quarter with 11 disposals. His 23 disposals should see the Hawks claim back-to-back NAB AFL Rising Star nominees after Harry Morrison's efforts last week. Gary Ablett was never going to make the same mistake two weeks in a row. After missing two shots on the run in last week's final term against Richmond– including one to win the match – Ablett kicked three goals at the same City End. Presented the same opportunity as his costly miss last week, Ablett nailed a goal on the stroke of 50m in the third term that threatened to bring his side back into the game. The champion finished with 32 disposals, taking his average against the Hawks to 38.3 from his past 10 outings. Hawthorn's decision to play two ruckmen paid dividends in the second term when Geelong No.1 Rhys Stanley succumbed to another calf injury. Late inclusion Mark Pittonet, playing his first game since 2016 as a replacement for Jarryd Roughead, teamed with Jon Ceglar. Defender Mark Blicavs was thrown into the ruck, partnered by 191cm rookie Jack Henry, who also spent time in defence. It led the Hawks to a clearance win (46-40) and Ceglar pulling in a massive five contested marks. Ricky Henderson was counting his lucky stars as Jaeger O'Meara sealed victory for the Hawks with a minute on the clock. Earlier in the final term, with the Hawks leading by 20 points, Henderson backtracked over the Geelong goal, coughing up a deliberate rushed behind. 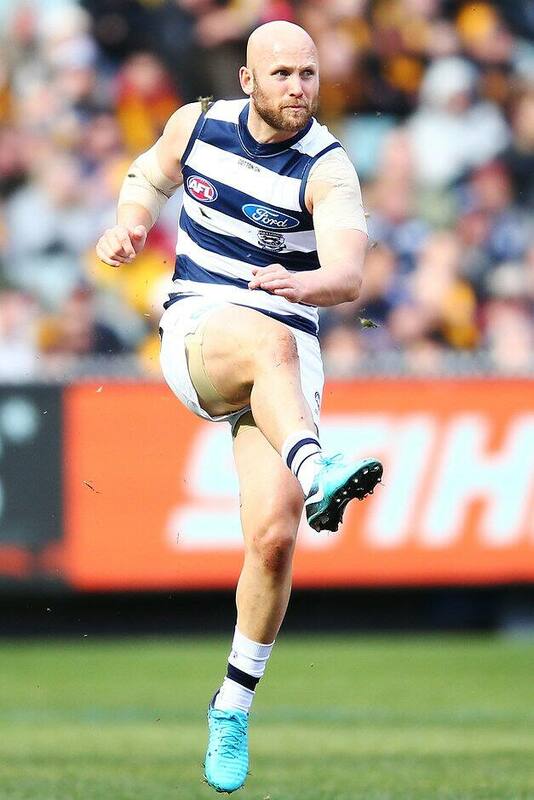 Cats forward Daniel Menzel, who was more than the length of the goalsquare away as Henderson rushed the behind, made the most of the resultant free kick. It brought the Cats within 14 points, before coming with a rush to get as close as six points in the dying stages. 5. Do goal umpires need a whistle? As Geelong made a late charge with three goals in four minutes in the final term, thoughts quickly turned to a moment in the first quarter where they were robbed of a behind. With the ball deep in the Cats' forward 50, Hawks defender Ryan Burton attempted a clearing kick which was taken over the goal line. Goal umpire David Rodan signalled a behind by tapping his chest, only to be missed by the controlling field umpire. The Hawks took the ball out of defensive 50, lucky to escape without conceding a score.